Wash and dry the octopus tentacles, cut them into pieces large 1 inch and place into a bowl. Peel and reduce the potatoes into dices large 1/2 inch, then pour in the same bowl. Now, combine the potatoes and octopus with, paprika, dried oregano, cayenne pepper, 2 cloves of garlic peeled and cut in half, and the olive oil. Stir well all the ingredients, then cover with plastic wrap and store into the fridge to marinate a couple of hours. Pre-heat the oven to 340­° F (170°C). 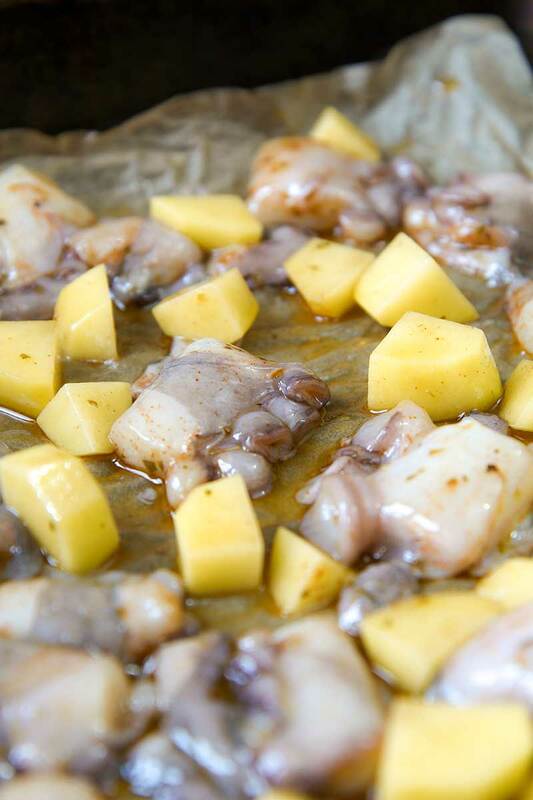 Discard the garlic, and pour the octopus and potatoes in a deep roasting pan lined with parchment paper. Cover the roasting pan with a layer of aluminium foil, and seal well on the edges. 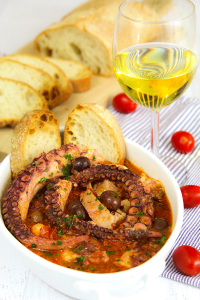 When the oven reach the right temperature, bake about 50 mins until the octopus and potatoes are well done. Atthis point, discard the aluminium foil, baste with the white wine and bake 10 minutes more. Finally, add 1 tbsp of capers preserved in vinegar, salt as needed, then bake 3 minutes more. Serve the oven roasted octopus hot. 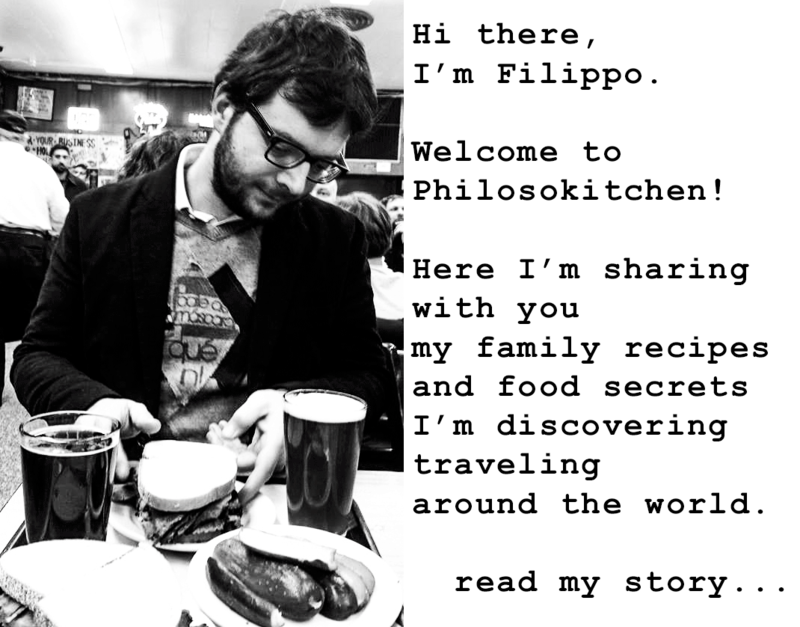 Unfortunately, is not possible to conserve this recipe for days to come, but I’m sure is not a problem: I’ve never seen any leftover on my table! 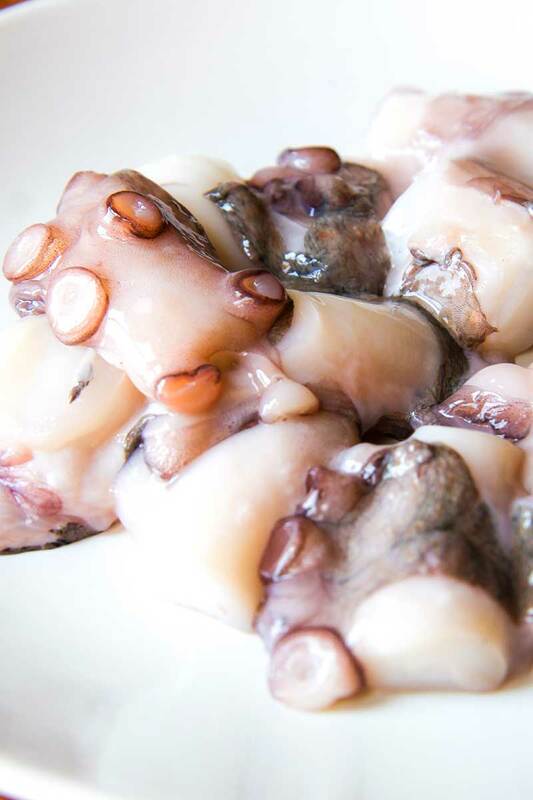 Wash and dry the octopus tentacles, cut them into pieces large 1 inch and place into a bowl. 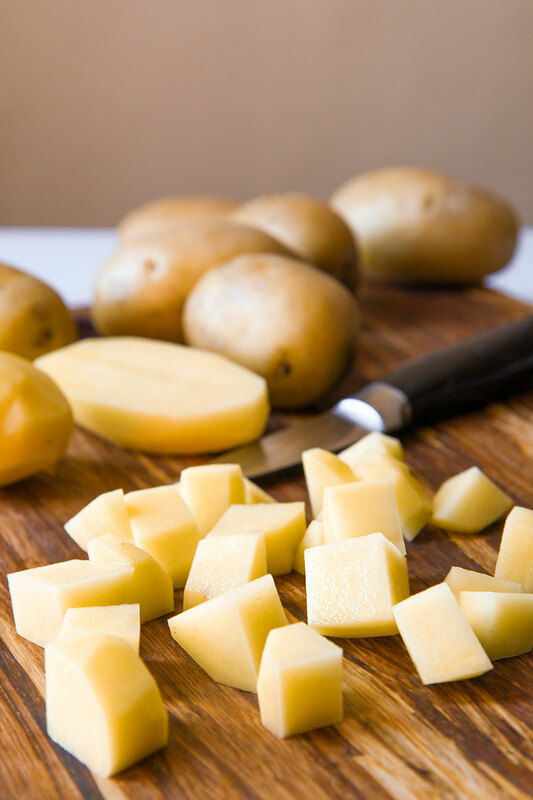 Peel and reduce the potatoes into dices large ½ inch, then pour in the same bowl. 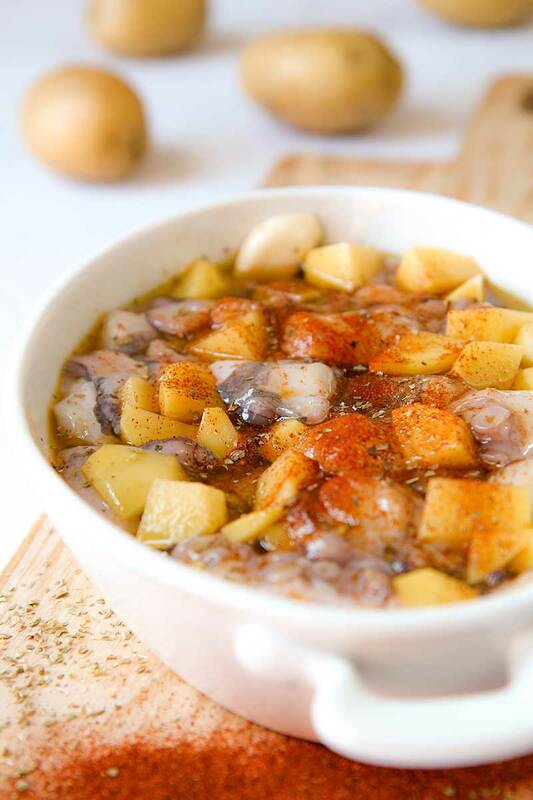 Now, combine the potatoes and octopus with, paprika, dried oregano, cayenne pepper, 2 cloves of garlic peeled and cut in half, and the olive oil. Stir well all the ingredients, then cover with plastic wrap and store into the fridge to marinate a couple of hours. Pre-heat the oven to 340­° F (170°C).Discard the garlic, and pour the octopus and potatoes in a deep roasting pan lined with parchment paper. Cover the roasting pan with a layer of aluminium foil, and seal well on the edges. 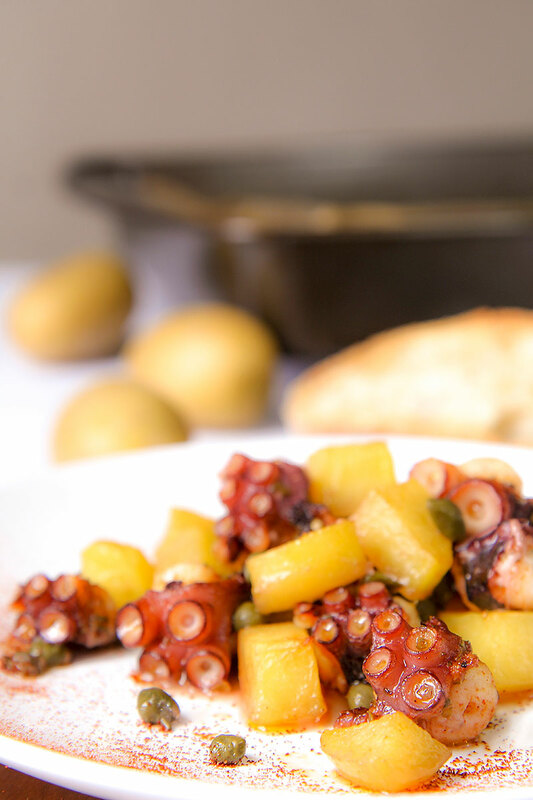 When the oven reach the right temperature, bake about 50 mins until the octopus and potatoes are well done. Atthis point, discard the aluminium foil, baste with the white wine and bake 10 minutes more. Finally, add 1 tbsp of capers preserved in vinegar, salt as needed, then bake 3 minutes more.